The M Chinnaswamy Stadium, Bengaluru lived up to its expectations of being a high-scoring ground. There were plenty of big hits but Australia won the race as well as clinched the series. India, despite scoring big, ended up on the losing end. There was dew on the outfield that didn’t help India’s cause. But credit must be given where it’s due. 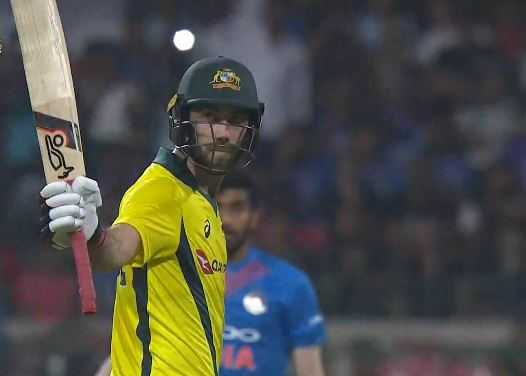 Glenn Maxwell was the star of the show as he blew India away with a swashbuckling knock. Once again, it was Aaron Finch who won the toss and asked India to bat first. KL Rahul looked fluent again while he had a new opening partner this time – Shikhar Dhawan. Rahul kept the scoring rate up but Dhawan was struggling for timing. Due to Rahul’s solo effort, India made 53/0 in the powerplay. As he was approaching his fifty, Nathan Coulter-Nile sent him back for 47 in the 8th over. Dhawan’s miserable stay of 14 from 24 was ended in the 10th over by Jason Behrensorff. Rishabh Pant then fell soon for a solitary run courtesy of D’Arcy Short. India was struggling at 74/3 after 11 overs. MS Dhoni and Virat Kohli came together and bailed the hosts out of trouble. Dhoni showed intent from the start this time. Kohli, at the other end, was batting at another level. He kept smashing the bowlers all around the park while Dhoni too took toll of the loose balls. Kohli scored an unbeaten 72 from 38 balls while Dhoni made 40 from 23. In the end, India reached 190/4. Australia, in reply, lost Marcus Stoinis early courtesy, Siddharth Kaul. Aaron Finch’s poor run of form continued as he fell for 8 off Vijay Shankar’s bowling. India was in a commanding position after the visitors were down to 22/2 in 4 overs. Short was still there as he was joined by Glenn Maxwell. The duo then took the attack to the opposition. They went after Shankar as well as the spinners. After 10 overs, Australia came back well and truly in the game as the score read 87/2. However, Shankar sent back Short for 40 off 28 balls in the 12th over. Short’s departure made absolutely no difference to Maxwell as he kept delivering the big blows. He brought up his 2nd fifty on the trot and there was no stopping him at all. Peter Handscomb was at the other end but he was a mere spectator. Maxwell kept punishing the bowlers as India was blown away. He ended up scoring 113 from just 55 balls with 7 fours and 9 sixes. Australia cruised home with 2 balls to spare and won the series 2-0.